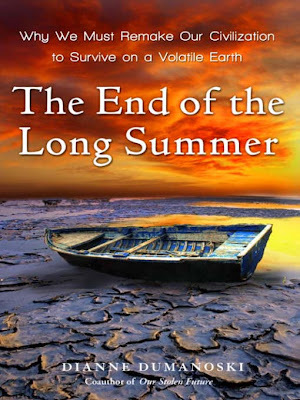 Our Thursday reading group is making its way through The End of the Long Summer: Why We Must Remake Our Civilization to Survive a Volatile Earth by Dianne Dumanoski. In her chapter entitled, “A Stormworthy Lineage,” she writes how human beings evolved (culturally and biologically) toward flexibility in the face of dramatic environmental change. For example we learned to cook food which allowed for our bodies to spend their energy developing larger brains (as opposed to digestion) which in turn enabled us to make tools and so forth to adapt to changes. The larger the brain, the more likely we can adapt to climate change. At the moment, however, our current civilization—which originated in the West but has come to dominate the world through the global spread of its economic system, technology, and values—seems caught in such a cultural trap; it is drawing us deeper and deeper into trouble. We exhibit an alarming unwillingness to admit that the world has changed and to recognize the dangerous folly of business as usual. Our way of life has been unsustainable for some time, and the world is unraveling around us, yet we are loath question the goals and values of the modern cultural experiment that put us into ever grater jeopardy. There is reason to despair at our failure of imagination, at our inability to conceive that this modern culture is not the only or best way of being human. P. 128. It would seem, then, that the highest goal of a church or religious group in our time is to question assumptions as opposed to promoting beliefs. We need to challenge the unspoken religious, economic, and political premises that seem to be directing us to collapse. In discovering what these premises might be, we could invoke the spiritual practice of awakening and consciousness raising that spiritual leaders in all of our wisdom traditions taught us. We are summoned to wake up and to speak our truths. Discovering images, parables, and metaphors that evoke clarity about our situation as well as what it means to be human is the via creativa or the spiritual path of creativity. We need to trust these images and to trust ourselves to speak them even when they seem odd or unconventional. Dumanoski and others are telling us that we are not going to solve or fix climate change. The suburban consumer driven lifestyle is unraveling. We are in for a ride. However, human beings have weathered such storms before. Adults have but one task. We need to prepare our children for a volatile Earth. Children born today are going to be the ones to remake civilization. We need courageously to acknowledge that change is coming, to learn how our ancestors weathered change, and to teach our children to trust and to develop creativity, flexibility, and imagination. I can’t imagine any more important task for a church community. Can you? Yes. Easily. How about 'proclaiming the reign of God'? Or perhaps 'following Jesus'? Or how about 'loving God and serving our neighbors'? It seems the phrases you mention can be used in the service of what I have written about. Religious metaphors can also be used in the service of fatalism and inaction and in even in some extreme cases actual destruction to bring on the apocalypse. I'm fairly certain your response just demonstrated that you believe the church's duty to proclaim the gospel of Jesus Christ is secondary to the project of teaching "civilization" to save itself. "God so loved the world..." Social righteousness is a key part of the Bible cover to cover. I think being aware of our condition and doing justice is following Jesus. So where and how do you follow Jesus? I was going to make a wise crack about "The larger the brain, the more likely we can adapt to climate change," but given pastormack's comments I will refrain. Seems to me the "gospel of Jesus Christ" is not about salvation from hell in the next life, but ushering in the kingdom of god (realm of distributive justice-compassion) in this life. That includes all beings in Planet Earth's biosphere, such as the rocks, the rivers, the trees, the animals, and all. Some time ago (1980s I think) women were forced to resign from Presbyterian national offices because of the idea that "Jesus is our Sophia" (see 1 Cor. 18-25). Wait 'til they discover Julian of Norwich . . . I was going to make a wise crack about "The larger the brain, the more likely we can adapt to climate change,"
Oh, do so anyway! That is a funny sentence, especially when it just kind of sits there, like the big heads in a jar that wisely ruled the planet in that old Star Trek episode. Well, I can't remember how that Star Trek episode went, but I do remember the big heads . . .
What I was going to say is that sentence seems to imply that those who can't adapt (adopt the concept?) of climate change have smaller brains than the rest of us . . . but then I think about evolution, and how birds (with some of the tiniest brains) are adapting already by staying north longer . . . and there was a hummingbird a while back that got totally disoriented and couldn't find his way back to Costa Rica. He is now luxuriating in an enclosed Bird sanctuary in Wisconsin, I believe. Who knows where his progeny might decide to take up permanent residence if they ever get out of Wisconsin? The theological implications of all this would seem to baffle the theology of our guest in comment 1. I should try again. The growth of brain size in humans allowed us to engage in more complex behavior (food sharing, cooperation, extended families) to innovate and use tools and therefore adapt to environmental changes. The point was that biology and culture work in concert. You would appreciate Dumanoski's book!